With the new year well into its stride, we focus our sights on the magnificent tropical cruising grounds of the Caribbean, South East Asia and South Pacific. Our 2015 Caribbean charter fleet showcases some stunning new yachts alongside many of our established and highly acclaimed favorites. In Asia and the South Pacific an exclusive fleet of superb vessels is plying the unspoiled waters of these magical areas. Still far enough off the beaten track to boast uninhabited islands and virgin reefs, they can be reached by well connected flights that give you the flexibility of ‘one direction’ charters to take advantage of the prevailing breeze. The good news is that sailing through many of these exotic groups of islands is now more accessible thanks to local airlines providing some excellent links. Direct routes from Antigua to the Virgin Islands (hooray!) and perfect connections from Barbados to The Grenadines – all to coincide with incoming long haul flights from Europe and the US. Ask us for Southern Hemisphere sailing and flights too. The ubiquitous catamarans are as prized as ever. With the flexibility to go anywhere – blue water sailing or shallow turquoise lagoons – at speed and in luxurious, stable comfort they span the divide between the worlds of sailing yacht and motor yacht: Acres of space for relaxing, incredible array of leisure and water sports equipment, great sailing and a brilliant venue to just lap up a little paradise. A new breed of motor cat is also becoming ever more popular. The Lagoon has just launched a 65’ version and both Sunreef and Horizon have a handful of very successful vessels out there which we can charter. In the motor yacht world, there is a sharp move towards building fuel efficient vessels that are ‘ecologically aware’ while still providing the perfect synchronicity of style, engineering, technology, luxury, sheer comfort and a good attitude. A bonus for the charterer is less spend on fuel, more on enjoyment! A great range of exceptional sailing yachts – both classic and modern completes the fleet. Sleek, fast, smart and ultimately cool. We have some great deals on a few of these. If you think you might be interested in one of these beauties, I urge you to get in touch quickly to find out more. Availability is precious. I’ll be delighted to talk through any ideas and questions you have and send you online brochures or point you in the right direction on our website and yacht search database. Please note that not all yachts can be seen on the database – we can send you additional yacht suggestions with web links and PDF’s to suit your preferences. With warm regards and wishing you happy cruising! 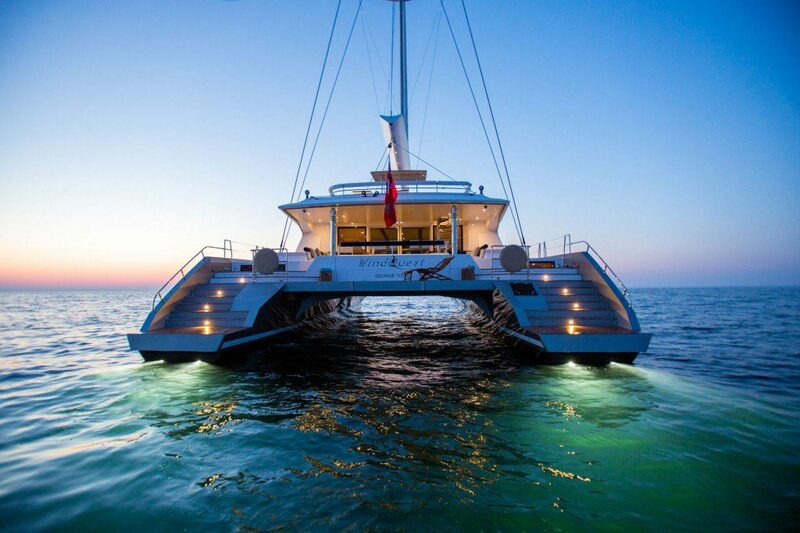 S/Y WINDQUEST – STUNNING NEW 85′ CATAMARAN. launched by VPLP 2014. Charter rate: $65,000 all inclusive per week. Enquire now.